Since the 3rd edition appeared, a fast evolution of the field has occurred. 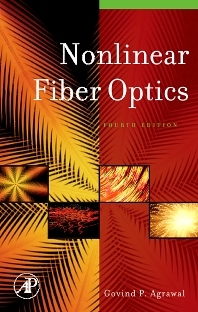 The fourth edition of this classic work provides an up-to-date account of the nonlinear phenomena occurring inside optical fibers. The contents include such important topics as self- and cross-phase modulation, stimulated Raman and Brillouin scattering, four-wave mixing, modulation instability, and optical solitons. Many new figures have been added to help illustrate the concepts discussed in the book. New to this edition are chapters on highly nonlinear fibers and and the novel nonlinear effects that have been observed in these fibers since 2000. Such a chapter should be of interest to people in the field of new wavelengths generation, which has potential application in medical diagnosis and treatments, spectroscopy, new wavelength lasers and light sources, etc. Govind Agrawal is the James C. Wyant Professor of Optics at the Institute of Optics of University of Rochester, USA. His previous appointments were at Ecole Polytechnique, France, City University of New York, and AT& T Bell Laboratories. He is an author or coauthor of more than 400 research papers and eight books. Professor Agrawal is a Fellow of the Optical society (OSA) and a Life Fellow of IEEE. He has served on the Editorial Board of many optics journals and was the Editor-in-Chief of the OSA journal Advances in Optics and Photonics from 2014 to 2019. In 2012, IEEE Photonics Society honored Dr. Agrawal with its prestigious Quantum Electronics Award. He received in 2013 Riker University Award for Excellence in Graduate Teaching. He was awarded in 2015 the Esther Hoffman Beller Medal of the Optical Society. He is also the recipient of the 2019 Max Born Award of the Optical Society.